The great majority of Scotland’s cottages and steadings were built during the Agricultural Revolution in the 18th century. This period witnessed the ‘Great Rebuilding’ of Scotland, replacing the traditional, vernacular structures with improved dwellings made of stone and lime (or clay/earth) and designed from agricultural journals and architectural pattern books. It heralded the demise of the medieval ‘long-house’ and traditional building materials such as timber, clay and thatch. However, this process of renewal was not complete or comprehensive. Different regions reacted differently to new farming methods and techniques. Local masons and craftsmen adapted old traditions to meet new demands. As a result, many vernacular structures remain particularly in Angus villages and Highland farms, quietly hidden beneath modern finishes and obscured by years of ignorance and neglect. 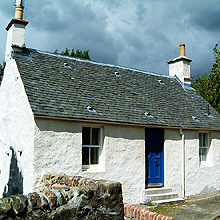 LTM recognise the unique challenges of Scotland’s cottages and steadings, from understanding and conserving vernacular materials to identifying and resolving building defects. LTM’s masonry teams have extensive experience with these type of buildings, ranging from small-scale pointing works to comprehensive restoration projects. The skills, materials and techniques used by LTM in the repair of such buildings are often common to the great cathedrals and castles, so you can be assured you’re with the right contractor with LTM. Cottages and steadings represent a significant proportion of our project portfolio. LTM Consultancy can also provide professional, technical advice on building defects and problems. We can provide a range of fixed fee* ‘Inspection and Recommendation’ packages to suit a range of budgets or where required, bespoke surveys designed to meet the specific needs of the building and client - this can form an essential step in addressing common problems such as water penetration and associated issues with internal dampness. *exclusive of travel costs. "Thank you very much for all the work that you and your team have put into this cottage. I am very pleased with the result."